TFCU is offering no car payments for 3 months! Enjoy the extra cash in your pocket. TFCU is covering the cost of Guaranteed Asset Protection (GAP) for all vehicles purchased and financed during this exclusive car sale. That is an estimated value of $610! TFCU has partnered with 70 local dealers to provide you with special member pricing. All manufacturer's incentives apply to qualified members! Get pre-approved for an auto loan with Tropical Financial Credit Union. Knowing the make, model, estimated purchase price of the car and your preferred loan term will come handy! Tell us your dream car-your ultimate wish list. Click below to tell our Auto Advisors what you are looking for and they'll get to work! +All loans subject to approval based upon creditworthiness, qualifications and collateral conditions. TFCU membership eligibility required with $5.00 minimum in savings. 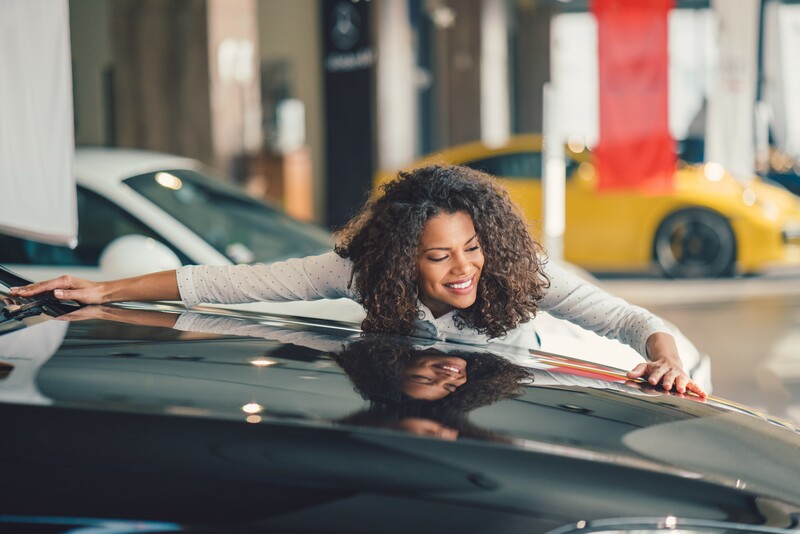 To be eligible for special Car Sale offers, you must apply for and be approved for your loan between April 15-April 30, 2019. Other restrictions apply. Offers subject to change without notice. Offer not available for current TFCU or SFAC or refinance loans. Other restrictions may apply. This offer may be removed at any time without notice. ** 90-day payment deferral subject to credit qualification. Interest will continue to accrue during the 90-day deferral period on the full amount borrowed beginning on the loan issue date. The accumulation of interest, with no payments being made to reduce the principal, will be added to the total repayment amount. *APR = Annual Percentage Rate. Eligibility for the lowest advertised rate is based on creditworthiness, year of vehicle, ability to repay, credit score, down payment and terms. Other rates and terms may apply and your rate may differ based on the loan program, term of repayment and other factors. Member must reside and purchase the vehicle within the state of Florida. Other restrictions may apply. Rates are subject to change without notice. 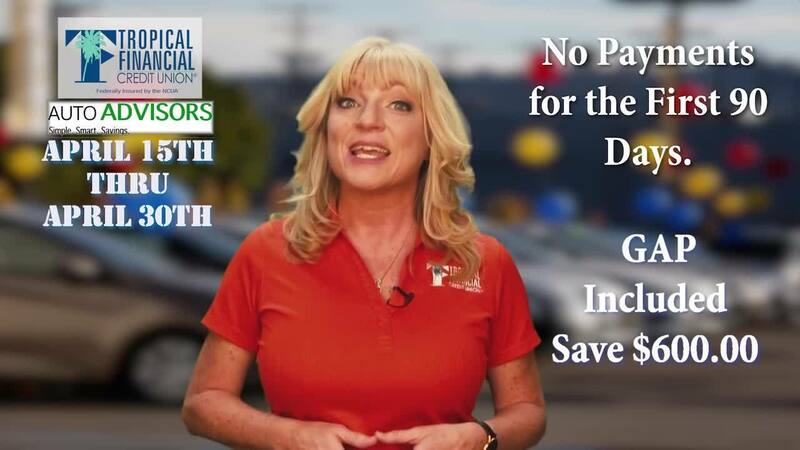 RATE DISCOUNT OF .15% when you purchase your car through Auto Advisors. 2.59% APR for 36 months up to 100% LTV. Rates Valid on 2016-2019 autos. Limited time offer which applies to purchases only. Cannot be combined with any other offer or loan discount. **Auto Advisor rate discount not applicable to Special “LTV” loan rate. 3.09% APR , 3.34% APR, and 4.20% APR includes a .25% reduction for members with a Premium Checking account. Automobile: New automobiles include autos current year and previous year. Used Auto includes previously titled vehicles 7 years old or newer. Up to 100% financing not to exceed the lesser of MSRP or the final purchase price plus tax and Vehicle Service Agreement on new vehicles or the NADA retail value plus/minus options and mileage on used vehicles. Older Used Auto includes vehicles 8 years and older and must reflect an NADA value. Rates are subject to change without notice. Other restrictions may apply. Auto loan example: $10,000 loan at 2.59% APR with 36 monthly payments of approximately $289.01.